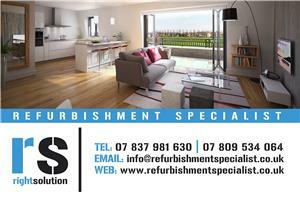 R S Right Solution Ltd offer a friendly and affordable building service in and around London. We are happy to offer a free quote and advice on any work required around your home and garden. We would always take careful consideration of any brief, finding the right solution and trying our utmost to meet or exceed our customers' expectations. Confidence in your builder is imperative and we are honest and respectful at all times and appreciate that there are many builders in London and the market is competitive, so we always ensure we give great value for money. Call us to discuss your project now.